Carnival glass is moulded or pressed glass, always with a pattern and always with a shiny, metallic, ‘iridescent‘ surface shimmer. The keys to its appeal were that it looked superficially like the very much finer and very much more expensive blown iridescent glass by Tiffany, Loetz and others and also that the cheerful bright finish caught the light even in dark corners of the home. Both functional and ornamental objects were produced in the carnival finish and patterns ranged from simple through geometric and ‘cut’ styles to pictorial and figurative. A wide range of colours and colour combinations were used but the most common colours accounted for a large proportion of output, so scarce colours can today command very high prices on the collector market. 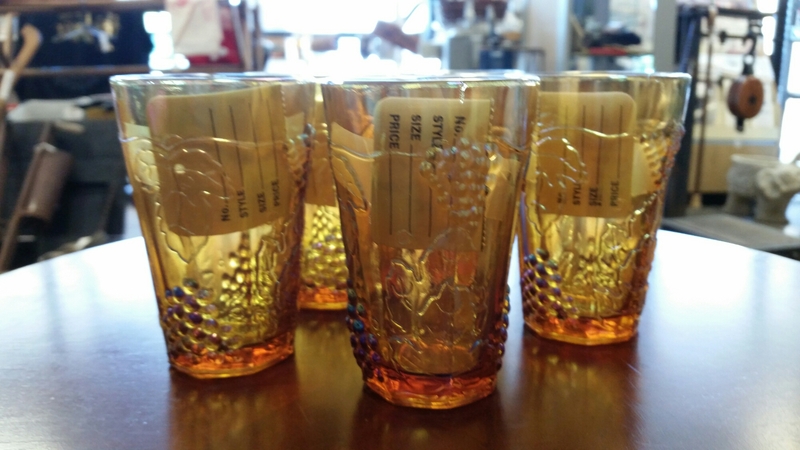 Carnival glass has been known by many other names in the past: aurora glass, dope glass, rainbow glass, taffeta glass, and disparagingly as ‘poor man’s Tiffany’. Its current name was adopted by collectors in the 1950s from the fact that it was sometimes given as prizes at carnivals, fetes & fairgrounds. However, that can be misleading as people tend to think that all of it was distributed in this way but evidence suggests that the vast majority of it was purchased  by the housewife to brighten up the home at a time when only the well off could afford bright electric lighting. 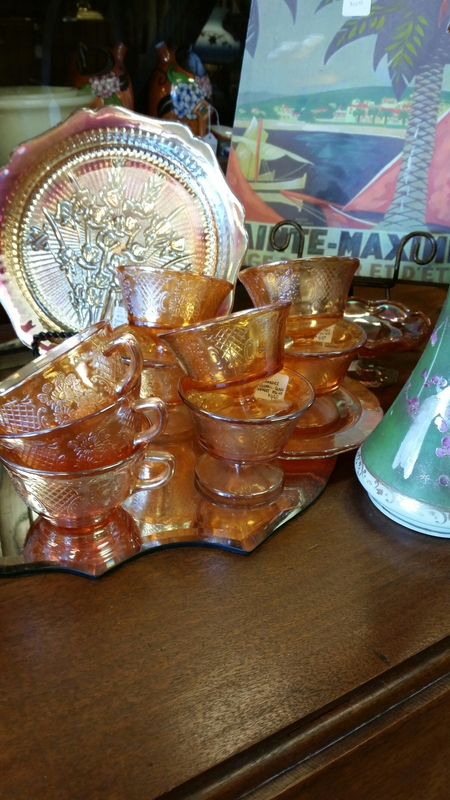 Some carnival glass is still produced today although in very small quantities. At the height of its popularity in the 1920s huge volumes were produced and prices were low enough for the ordinary home to afford. 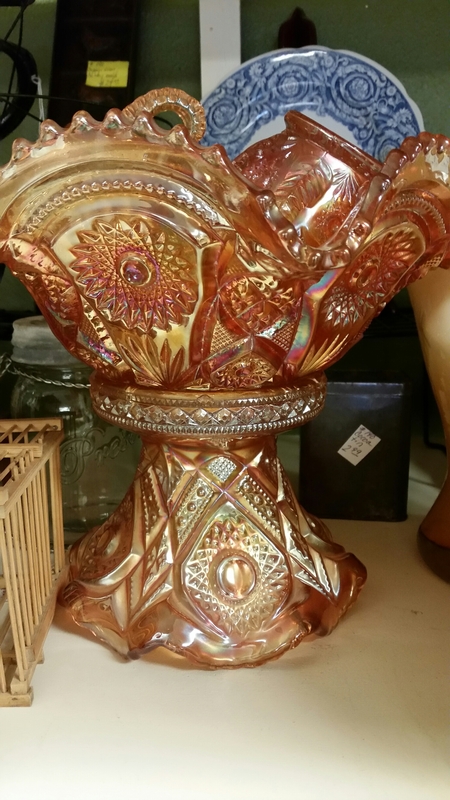 Starting at the beginning of the 20th Century Carnival Glass was eventually produced on every continent except Africa and Antarctica but largely and initially in the U.S.. All the major European glass making centres except Italy produced some and it was very popular in Australia. 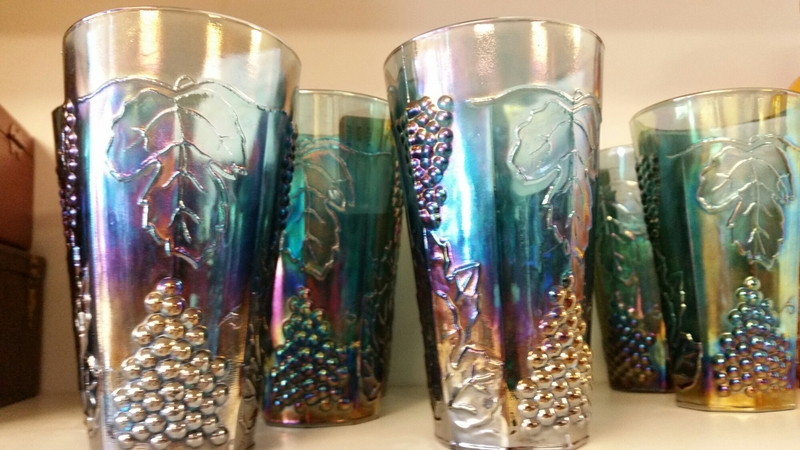 Carnival glass gets its iridescent sheen from the application of metallic salts while the glass is still hot from the pressing. A final firing of the glass brings out the iridescent properties of the salts, giving carnival glass the distinct shine it is known for. 2 Miles North of I-70 on Wadsworth Blvd. North East Corner of 64th & Wadsworth Blvd. Have Travel will Antique ! © 2019 Homestead Antique Mall. All Rights Reserved. Site by Sublime Creations, LLC. Hosting by Grant Garrison.